An iconic film that created history in itself. 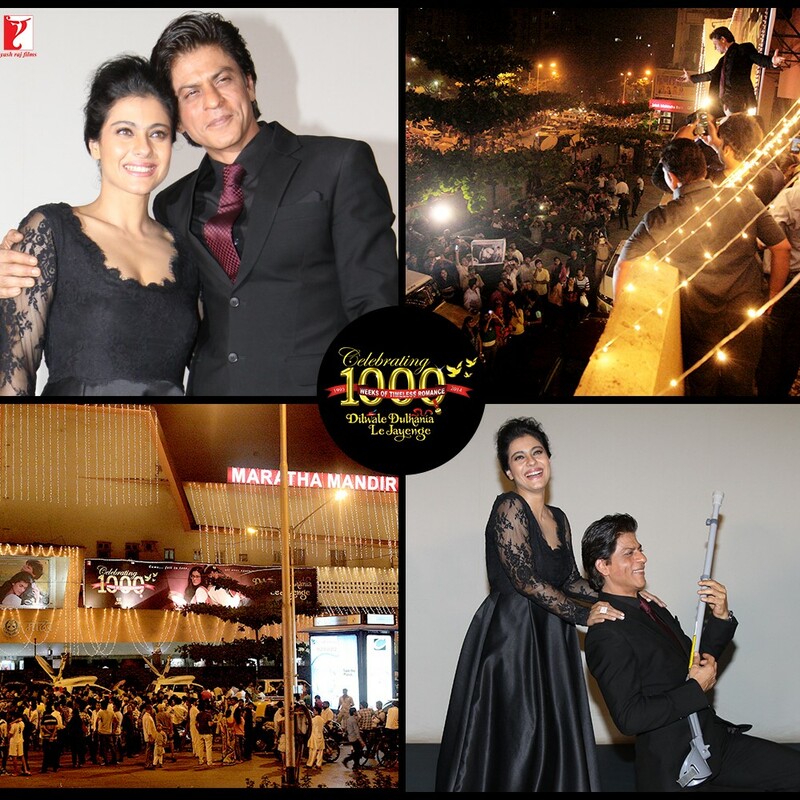 Watch the lead pair Shah Rukh Khan & Kajol join in the grand celebration of 1000 weeks of DDLJ at Maratha Mandir! Superstars Shah Rukh Khan and Kajol came together at YRF Studios to celebrate the longest running film in the history of Indian cinema – Yash Raj Films’ iconic Dilwale Dulhaniya Le Jayenge directed by Aditya Chopra. “It’s been 20 years for this film and I feel honoured that I was part of this film. It’s been 100 years of Indian cinema and I would say one-fifth of it belongs to DDLJ”, Shah Rukh Khan said and no one could have said it any better! The DDLJ pair recreated the ‘DDLJ magic’ as they effortlessly recalled all their fond memories from the film, enacted scenes and recounted dialogues. It seemed like it was only yesterday that the actors worked on the movie. SRK, carrying Raj’s trademark knapsack, filled with memories still reverberating with audiences even today, along with his Simran, the ever bubbly Kajol, shared never before heard movie trivia and anecdotes about Director Aditya Chopra and Producer Yash Chopra. A spontaneous request to Pam Chopra, who was in the audience, to sing the still popular Tujhe Dekha Toh Yeh Jaana Sanam, left people wanting the evening never to end. The celebration continued with the unveiling of the very exclusive and special coffee table book written by the private and reclusive Aditya Chopra, about the making of DDLJ. The revelry continued at Mumbai’s iconic MARATHA MANDIR CINEMA where SRK and Kajol regaled the audience in their inimitable style and interacted with a full house of DDLJ lovers who had come to fall in love again and again…! A Memento of Appreciation was also presented to the theatre. The movie released on 20th October 1995.